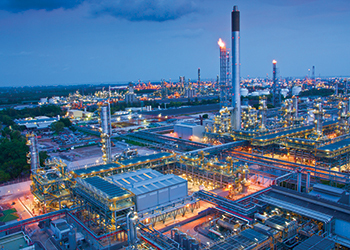 Intergraph Process, Power & Marine (Intergraph PP&M) has a long track record in developing and offering integrated design, construction and operation solutions for the petrochemical, offshore, and oil and gas industries. Intergraph’s SmartPlant Enterprise is a comprehensive product suite offering increasing value from IT in order to improve project execution, handover, and plant operational efficiency. SmartPlant Enterprise solution offers a powerful portfolio of best-in-class applications, which may be deployed individually or as a flexible, integrated enterprise solution – allowing an organisation to successfully unleash the untapped value that is often restricted by silo-centric communication and execution. At the centre of SmartPlant Enterprise software is Intergraph Smart 3D. It provides a fully integrated 3D design and manufacturing environment to support the design of plants, marine, and materials handling facilities. Smart 3D can handle the dense and complex structural and outfitting designs required in modern design projects. Seamless data integration: Intergraph SmartPlant Enterprise solutions are delivered with out-of-the-box integrated architectures that seamlessly integrate the flow of information between them. Data and design parameters are entered only once into the authoring disciplines and reused downstream. The out-of-the-box integration is a change management environment that facilitates publishing, retrieving, reviewing and comparing data and documents electronically between disciplines. Real-time global work sharing: All enterprise applications, including Smart 3D, deliver global work-sharing capabilities, allowing companies to electronically share work internally or externally in real time. In addition to the schedule benefit of leveraging other offices, Intergraph’s work-sharing capabilities improve quality by electronically enforcing all project or company standards around the globe and maintaining interface points within an application and between different discipline applications. Efficient design: Intergraph Smart 3D is the most advanced and productive 3D design solution that effectively enables optimised design, increasing quality, interoperability and productivity, while shortening project schedules. Smart 3D enables more efficient design, providing better quality and design integrity. In addition, Model Data Reuse (MDR) capabilities enable efficient reuse of design that is not possible in any other 3D CAD application. Users can reuse Feed or old designs with different catalogues and specifications by leveraging Smart 3D’s unique rule reuse, tag renaming and specification interchange. Chosen by industry leaders: "Yasref has implemented SmartPlant Foundation as main depository system to hold all of the engineering data and documents for a mega-sized refinery project in Saudi Arabia. Having the deliverables from all EPCs in SmartPlant format, Yasref is able to uphold the utmost integrity of the information on hand, and ensure the availability of the data to all Yasref personnel in the right format at the right time," Abdulhannan M Karim from Yasref comments. "Agility Group has used Smart 3D, SmartPlant P&ID and SmartPlant Materials in a number of relevant projects in the offshore oil and gas market, experiencing improved productivity and lowered operating costs, thanks to improved project management," says Terje Ørbeck, SmartPlant team group lead at Agility Group in Norway. "Intergraph Smart 3D is currently used in topside modifications on the Gullfaks Rimfaksdalen platform in cooperation with Statoil, Samsung Heavy Industries, BP and Chevron. Intergraph solutions are also facilitating the building of a deep water drilling vessel with STX Offshore and Shipbuilding in Korea," he adds. Other Intergraph customers include companies such as Bechtel, Clough, Samsung, PT Saipem and CB&I. Reduced schedules, increased efficiency: Intergraph solutions’ planning environment reduces the overall project schedule by allowing companies to define physical boundaries and construction packages for the different modules / blocks at early stages of the project. These dynamic, multi-discipline definitions define the objects belonging to each block and the total volume, weight and center of gravity for the module.